This is the first book of Meg Cabot’s that I have read, but it certainly won’t be the last. It was fantastic! I think the whole Twilight thing started my new passion for books about vampires so that was the first reason why I initially wanted to read this book. It was a different kind of vampire story and one with some dark humor! I know this sounds odd for a vampire book, but it was actually quite funny. I love Meg Cabot’s oddball humor. I was cracking up at some of the things the main characters said and the way they were described. It’s totally my kind of humor! Jon, Meena’s brother, is absolutely HILARIOUS! I was in stitches reading some of the things he said and did. It did take me a little bit before I was into the book. After I got about half way through, I couldn’t stop reading! I loved all the action scenes with the vampires. However, I am a sucker for romance so the best parts were when Meena and Lucien, the vampire and Lord of Darkness, were together. I think the author did an amazing job at conveying the smouldering passion between them. My favourite character was actually Alaric Wulf, the Vampire Hunter who works for the Palatine Guard, whose main mission in life is to kill as many vampires as he can. He is described as a huge strong man who finds himself oddly having feelings for Meena, the girlfriend of Lucien, the Lord of Darkness. I loved the way that relationship developed and I was rooting for Alaric over Lucien to win Meena’s heart. I won’t spoil it for you and tell you who she ends up choosing though! 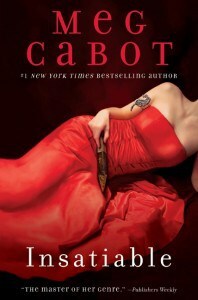 I will definitely be going out and buying more books by Meg Cabot! I am going to the library tomorrow to try out some of her books! Sounds great! Thanks for the tip!